* Dualboxing / Multiboxing is strictly forbidden in Dynamis/Limbus. It can crash your client and/or bring the server down. * Dynamis/Limbus is an open zone with no way to lock players out. Please be courteous by using the /search command to check the area for other players before entering the zone. Limbus is a mysterious dimension that lies between Vana'diel, Promyvion, and Lumoria. It is accessible from the celestial realm of Al'Taieu. Items can be obtained here that can be redeemed for upgraded Artifact Armor and Rare/Ex equipment. Limbus is comprised of two zones: Temenos and Apollyon. Items obtained from these bosses can be redeemed for pieces of two high-level sets of armor from the Near East. To enter Limbus areas, you must currently be on Garden of Antiquity (Chapter 8 of Chains of Promathia or higher. This is needed in order to access Al'Taieu from which Limbus may be entered. Two Key Items are required for each person's entry into the Limbus battlefields. The second is a colored Key Card (Key Item) specific to the entrance that one wishes to use to enter Limbus. The card can be obtained by locating and defeating one of the Aw'euvhi NMs in the area near your desired Limbus entrance. Doing so will grant the key item to all party/alliance members. Only alliance members who are currently in the zone (regardless of whether they are dead or alive,) when the Aw'euvhi dies, will receive the Key Card(s). Refer to the chart to the right to locate the entrance that corresponds with each Limbus area. After the entire alliance has obtained both Key Items, zone into the lobby for the Limbus area you have chosen. 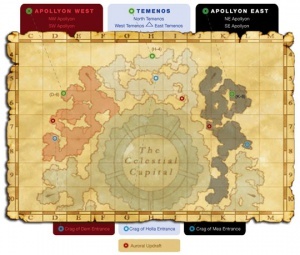 Check the Sentinel Column (Apollyon zones) or Scanning Device (Temenos zones) to ensure that there is no alliance already in the desired area. If the area is unoccupied, you may apply buffs and have one person check the Swirling Vortex (Apollyon) or the Matter Diffusion Module (Temenos) and select the Limbus area you wish to enter from the list provided. Alternatively, you may trade the appropriate chip(s) to Swirling Vortex/Matter Diffusion Module to enter a higher floor of the corresponding Apollyon]]/Temenos area (hierarchy displayed in the table below.) You (and the rest of your alliance) will then receive the message "You hear a faint hum." Check the Swirling Vortex/Matter Diffusion Module to join that area into Limbus. Be advised that all players will lose both of their Key Items upon entry into a Limbus battleground. Be sure not to engage in a battle before all members of the alliance/party have entered the battleground. If someone does manage to engage a monster within Limbus, then those that have not entered will be unable to join the current battlefield. All players in the alliance when the "hum" starts will not be able to enter a different area until the hum stops when the alliance is done with the area that was picked. So if you want to do two areas at the same time, with one alliance, form the alliance after entering both areas. In this manner two (or more) areas can be done at the same time, while everyone can lot on items from both. But be advised that members may experience confusion of tactics and strategy within the party chat. The term "Area" as referenced in this paragraph refers to the entrance of two (or more) different floors from within either Apollyon or Temenos, but does not apply when entering both Apollyon and Temenos at the same time. Once everyone is inside the area, the alliance is free to engage their first enemies. Unlike entering the area, any further teleportation within the area is not hindered by engaging enemies. On entry of an area that requires chips to enter, the chip(s) will be consumed. Entering: Upon entering, both key items are lost. If you exit the battlefield, you cannot reenter. If your connection is lost, you can reconnect before the originating party's time expires. If someone has not entered when the first monster is attacked/aggroed, they cannot enter and receive a message stating that the party is already engaged in battle. Reentering: 20 hours (Earth time) must pass after you enter a Limbus battlefield and consequently lose your Cosmo-Cleanse before you may obtain another Cosmo-Cleanse again from Sagheera and prepare to enter another Limbus area. Clearing: Upon opening the area's final treasure chest, the Limbus area is cleared and you are automatically ejected to the lobby where you can distribute the resulting treasure. Death: Experience Points are lost if you are defeated within Limbus. Enemies in Limbus do not grant experience points. Trading chips: Once chip(s) are traded to gain access for an advanced area, they will be immediately consumed and disappear from the player's inventory. Only the first party member to enter a Limbus area requires chips, if any. Armoury Crates are scattered throughout each Limbus area. The rules for their behavior vary in each different area. Please note that Armoury Crates may trigger enemies to be spawned. In some areas, opening a chest causes other crates and/or enemies to disappear, forcing you to choose one per level. Limbus rewards include items to upgrade your Artifact Armor into Artifact Armor +1 and items purchasable from Sagheera using Ancient Beastcoins. You can upgrade your Artifact Armor by trading it along with various items and Ancient Beastcoins to Sagheera in Port Jeuno. Here on HomepointXI server, all monsters in all Limbus areas can now give you any jobs item without restriction, in the form of a per player bonus drop that bypasses the party treasure pool. Each player in your party or alliance has their own separate chance at attaining the bonus item on every kill. Any job's upgrade materials may be obtained. Sagheera also requires a crafted item and 15-40 Ancient Beastcoins, depending on the piece. Trade her the Ancient Beastcoins first; in a separate trade, give her the rest of the items. Wait until the next game day and then talk to her again to receive your level 74 AF+1. If you wish to get the original AF back, you must re-visit any AF storage NPC to re-purchase the original AF set. Limbus is the Latin word for Limbo, meaning "edge" or "boundary". Limbo is a word used in general for being stuck with nowhere to go until something else happens, but it has its origins with Christian belief (Roman Catholic exclusively). In Catholic legend, Limbo is a realm where the virtuous humans who died before the resurrection of Jesus Christ reside and where unbaptised infants who die reside. This is the realm where souls exist which cannot go to Hell for they have committed no sins or lived virtuous lives, but they cannot go to Heaven because they are not a part of the Catholic faith. There are names for each of the 2 Limbos: Limbus Patrum (Limbo of the Fathers, where the virtuous Pagans reside) and Limbus Infantium (Limbo of the Children, where unbaptised infants reside). It is not a part of official doctrine (unlike Purgatory). In Medieval literature, specifically Dante's Divine Comedy, Limbo is the First Circle of Hell.